“Yes ma’am”: the words a migrant domestic worker in Singapore repeats most — but they can mean much more than simple subservience. But today, celebrating #InternationalMigrantsDay, we investigate the meanings of “yes ma’am”, and how domestic workers are able to adeptly re-negotiate the terms of her employment by transforming the “yes ma’am” script. James Scott, an anthropologist writing about village status hierarchies in Malaysia, outlines his concept of the ‘theatre of power’. In this theatre, Scott argues, ‘public transcripts’ — normative ways of communication such as the “yes ma’am” dialogue — reflect expected social and cultural norms. They are circulated within a balance of power that privileges one group (in this case, the employer) over the other (here, the worker). The public transcript of “yes ma’am” indicates a performance of deference, obedience, and submissiveness: standing in an attitude of listening and attentive politeness; ensuring that one’s tone of voice is quiet and respectful; and endeavouring never to contradict or argue with one’s employer. We speak to two experienced Taiwan-bound domestic workers at a training centre in Jakarta. Public transcripts are counterweighted by what Scott calls “hidden transcripts”: “offstage speeches, gestures, and practices that confirm, contradict, or inflect what happens in the public transcript” (Scott 1990: p. 4). These hidden transcripts brew best when they are shared amongst those who are not in power. Domestic workers teach each other hidden transcripts to deal with difficult situations. These might include insufficient food, no/few days off, late payment of salaries, overwhelming workloads, lack of sleep, and expectations to work in multiple households. Without clear, obvious instances of physical, verbal, or sexual abuse, and the need to pay off hefty loans ranging up to SGD $3000 (USD $2123) during the first 6-8 months of her contract, a migrant domestic worker may not wish to seek help from external authorities at the possible expense of her job. So they turn to each other for advice instead. Experienced domestic workers say that there are ways to effectively communicate their needs to their employers — you just have to do it right. They know very well what an employer expects — and they are able to use the expected ‘public transcript’ to their advantage. When Tinah relates the script that she suggests the migrant worker should use, she does not simply utter the words: she performs them. Her voice takes on a tone of uncertainty and fear, and she spreads her hands out in a conciliatory gesture. This is in keeping with the expected ‘act’ that should play out between maid and madam — a migrant domestic worker should refrain from being too forward and should be keen to put her employer first. This is not a confrontational approach; it does not invoke a rights-based discourse — however, it subtly articulates a worker’s knowledge of the legislation that have been put into place to protect her, presents her complaints in a socially acceptable way, and seeks to improve the conditions of her work. Had she spoken to her employer in a way that deviates from the public transcript (such as with a tone of aggression or anger), she might have risked openly transgressing her ‘appropriate’ social location in relation to her employer; by couching it in a performance of subservience, she might be able to win benefits without reprisal. 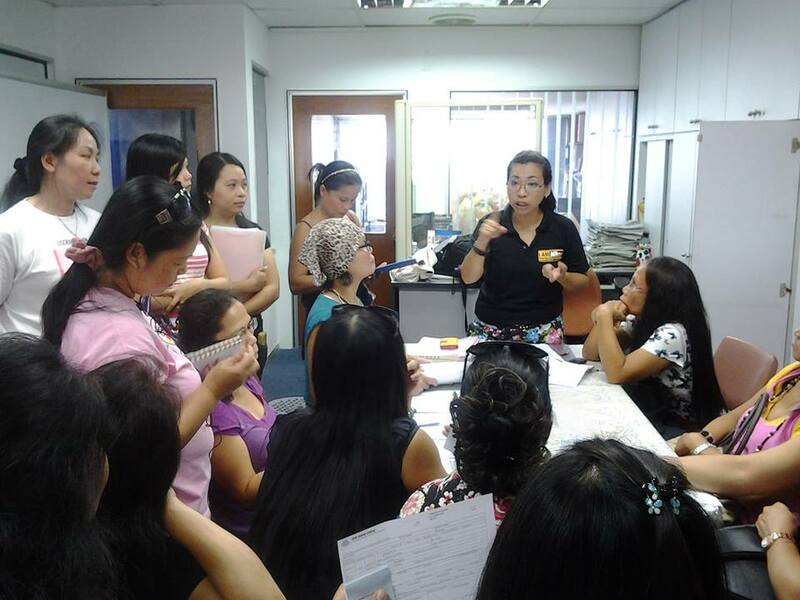 Leaders from the Filipino Family Network conduct a briefing at Transient Workers Count Too (TWC2)’s offices. The Filipino Family Network and Indonesian Family Network are sister organisations affiliated to TWC2. They are entirely domestic worker run, and conduct classes and organise social gatherings. For newcomers to Singapore, these networks are valuable resources — an oasis of familiarity in a strange land. Nuraini suggests that workers ‘set the stage’ in the theatre of power by ensuring that conditions are ideal for employers to be receptive to workers’ requests. Surroundings should be tidy; employers are best approached after a well-cooked meal and some rest. Respectful addresses like ‘ma’am’ or ‘sir’ should be frequently employed. Nuraini suggests that workers adopt a posture of professional politeness (such as maintaining steady eye contact and not appearing overly uncertain), while keeping to expectations of the public transcript — explicitly acknowledging the superiority of the employer, building an overall impression of humility, taking the initiative to circumscribe the boundaries of ‘privileges’ (such as a day off) in order to indicate a willingness to compromise. Like Tinah, she suggests that the worker display her knowledge of protective legislation, such as deadlines for salary payments. Scott says that a mastery of the “theatre of power” may “become an actual political resource of subordinates […] what may look from above like the extraction of a required performance can easily look from below like the artful manipulation of deference and flattery to achieve its own ends” (Scott 1990: p. 35). Migrant workers independently undertake a range of strategies to improve their working conditions within the countries in which they work. This may range from protests, creating unions, participating in campaigns – to giving each other pragmatic advice about delicately navigating through tensions at work. While these ‘transcripts’, taught by experienced workers to fresher faces, may not fundamentally transform the state of migrants’ rights, they are a concrete and practical tool to secure advances in what a worker eats, when a worker sleeps, and where a worker goes — items of negotiation fundamental to day-to-day life. Migrant workers are not always passive victims of abuse or sacrificial heroes, as they are oft presented in the media; they, too, are employees like many other employee — caught within structural forms of disempowerment, but able to strategise their way through with mutual help and support. ARI and the Migrating out of Poverty team wish all migrants a happy International Migrants’ Day! This research draws from the author’s personal work, her Honours Thesis titled ‘Work Permitted: Foreign Domestic Workers‘ Collective Strategies of Negotiation in Singapore’. The fieldwork was conducted in 2014. With many thanks to the Indonesian Family Network, the Filipino Family Network and Transient Workers Count Too for their help.